The above picture was taken just before the Oct. 2 talk given at Unity Church by Amy Goodman of Democracy Now, the program airing twice daily on Boulder’s (and Denver’s) community radio station, KGNU-FM (heard at 88.5 FM in Boulder and environs). 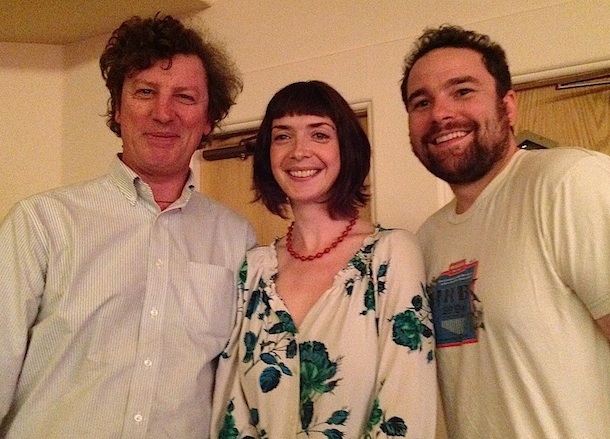 Pictured are (l. to r.) Joe Richey, general manager of Alternative Radio, Maeve Conran, co-news director of KGNU, and Gavin Dahl, Alternative Radio’s newest staff member. Gavin’s previous position was as news director at KYRS in Spokane. He’s also current president of the board of Common Frequency, an activist engineering nonprofit working together with Prometheus Radio and other groups to support the licensing and construction of new community radio stations, primarily on the West Coast. Gavin joins David Barsamian and Richey helping Alternative Radio zoom into its 26th year of international audio syndication. Let’s call him the newest member of Boulder’s awesome cast of progressive media activists. A thousand cheers for them all! In the coming years, we’re gonna need them. And, at year’s end, give some thought to helping fund them.